Tom Woodward is being recognized as the April 2018 member of the month for a multitude of different reasons. Tom sets the example for fellow members on a regular basis. Tom is always in proper PPE and steps off the truck ready for any task assigned to him. Tom’s positive attitude and ability to take direction gives him the respect of his peers, in turn they look to him for assistance and guidance. Tom also has shown that he can operate fire apparatus in a safe and knowledgeable manner. Once at the scene, Tom understands what is expected of a pump operator and is always ready to learn another tip or trick from a senior member. In addition to being a fireground leader, Tom also is willing to assist with association functions. Tom is not afraid to be apart of a conversation and give his all to better the future for us. Specifically Tom understands the importance of recruiting new volunteers and most importantly retaining them so we can continue to be a leader in firefighting within Monroe County. Tom clearly is invested in this organization and we are lucky to have him with us. 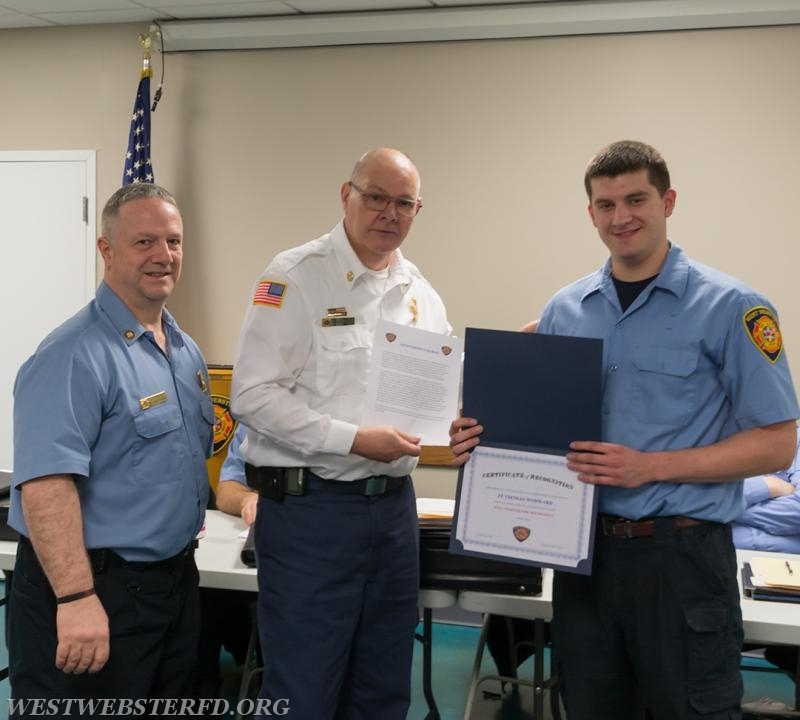 On behalf of the line and civil office, we would like to congratulate Tom for his leadership and perseverance to help West Webster continue to strive to be the leaders in the fire service field. Your knowledge goes a long way toward making "us" a leader in the Volunteer Service. Way to go Tom. Your a great example to my kids. It is great that example continues throughout your life. thank you for your service.